Today is a very special day for Cassandra Clare and readers of her The Shadowhunter Chronicles because on March 27, 2007 Cassie’s City of Bones was published and many lives were suddenly forever changed. We were introduced to Clary, Jace, Simon, Isabelle, Alec, and Magnus and entered a world where “all the stories are true”. Furthermore, you can read the original prologue for City of Bones here and the full greenhouse scene from Jace’s POV here. Cassie took to her twitter to say thank you and to share a link to the tenth anniversary edition. The tenth anniversary of Cassandra Clare’s phenomenal City of Bones demands a luxe new edition. The pride of any fan’s collection, City of Bones now has new cover art, gilded edges, over thirty interior illustrations, and six new full-page color portraits of everyone’s favorite characters! This beautifully crafted collector’s item also includes four bonus stories that have previously only appeared in limited distribution, and—best of all—a new piece written by Cassandra Clare. A perfect gift for the Shadowhunter fan in your life. We cannot wait to own this edition. 🙂 We hope Cassie is having a wonderful day and we are so excited for what is still going to come *raises glass* Here’s to you, Cassie and thank you for your books! Are you going to buy the tenth anniversary edition, what are you most looking forward to and what’s your favourite City of Bones moment and/or quote? You can also tweet us (@TMI_Source) and use #CoB10thAnniversary to check what other fans are saying about the anniversary. Remember buying my first and only copy I have so much love for this universe. Oh, you’ve got the old UK cover, nice! I love and hate that she releases so many special editions. I just bought the new cover version of CoB (with greenhouse POV) and now I’m going to buy it again because I can’t help myself. My husband doesn’t know what to do with the fact I’ve bought like 2 copies of each because she keeps releasing new ones with extras. Marketing genius! Marie. It is not Cassie’s decision to release a another edition of City of Bones as it is also not her decision to release several special first editions of Lord of Shadows. It’s her publisher. Please see her response to another similar comment in the previous article about the LoS editions when someone said something similar. The Mortal Instruments helped me survive the last years to retirement from 2007 to 2011. Thank you Cassie for helping me to stay sane. I’m so glad that I have the books with the original covers. 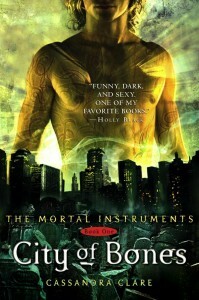 For me, they capture the spirit of the Shadowhunter Universe best. Nice to see you commenting again, ShirlB! I’m glad the books helped you so much. Have you seen Cassie’s tentative schedule for more The Shadowhunter Chronicles books?